I am offering a unique blend of Chinese Medicine, Ayurveda, Functional Medicine and Health Coaching. We meet for 60 minutes in your first session and determine a unique treatment plan to obtain your health goals. If you know you are seeking a particular service, that’s OK too but we will start with an initial session. This is where we start. In this initial first session we will do an extensive health history from a Chinese Medicine/Ayurveda/Functional Medicine perspective. By combining these multiple health systems in your initial consult we will help to shape your treatment plan customized for you based on services offered. I also offer this virtually. When you come in for a follow-up service we will complete the observational portion which includes tongue and pulse diagnosis. If you are suffering from any of the following conditions, acupuncture may be right for you. Acupuncture is the insertion of fine, sterile needles at specific points in the body in order to promote healing, increase circulation, and restore the body to balance. At Love Hive, I offer unique focused mini-sessions: Stress Less, Rest and Digest (Digestion), Flow (Hormonal), Calm (Anxiety), Clear Mind, Seasonal, etc. Marma therapy is an important tool for preventing and treating imbalances in Ayurveda. Prana is the current of energy that infuses every cell within the body. Stimulating marmani points directly taps into this reservoir of energy and promotes health. Marma therapy balances the flow of energy through the muscles, joints and organs of the body. While lying on the massage table, very gently pressure, like acupressure, is used on the marma points. Marma therapy balances the body, increases digestive fire, provides detoxification, promotes energy and rejuvenation. Essential oils or herbalized oils and tuning fork are the main methods for treating the marma points. 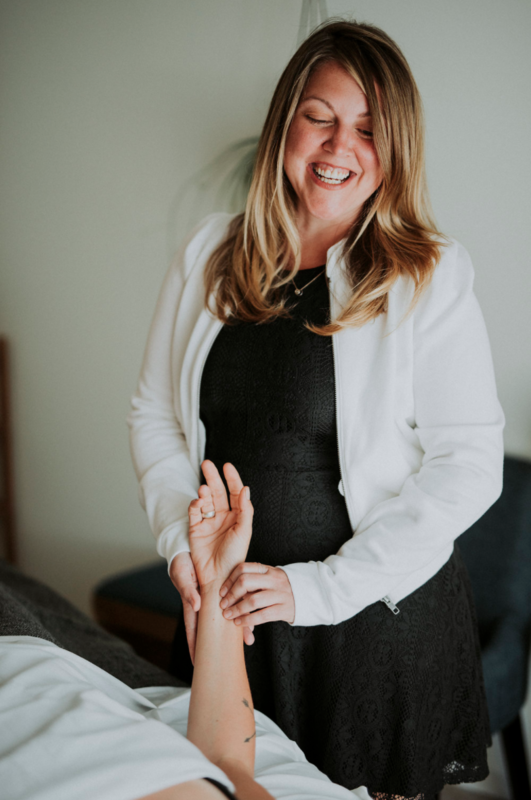 In addition, Jen uniquely combines Shiatsu East Asian massage therapy using fingers and hands to apply pressure to various areas of the body to correct imbalances in the body. In addition to being a deeply relaxing experience, Shiatsu helps relieve stress, treat pain and illness, and contributes to a patient's overall health and wellbeing. Shiatsu regulates the autonomic nervous system activity and stimulates the circulatory, lymphatic and hormonal systems. After determining your unique constitution (body type) according to traditional Ayurvedic principles in your intake session, in session 2 follow-up, we will create specific recommendations around lifestyle, nutrition, herbal supplementation, breath and movement. Your follow up appointment should be scheduled within two weeks following your first consultation. Note, Reflect your Nature Signature Session needs to be booked first. Cupping is a treatment that uses glass cups on the skin and stimulates qi and blood flow to promote healing and release muscle tension. External Bastis include oil application therapy with specific herbal oil. A dam made out of dough will be filled with oil and placed over the body areas with warm medicated oil or substance. Some of the qualities clients share as a result are peace of mind, inspiration, abundance and a sense of wholeness. Many of these classic therapies address calming and centering of the mind by utilizing the warm nourishing heavy qualities of oils. Hrid Basti involves placing Ayurvedic oils over your heart area to help nourish, strengthen, balance heart functions, and rejuvenate the heart. This is also an effective therapy for asthma and other respiratory problems. Melts away stress and emotional grief. I also recommend this for Fertility for the Heart/Uterus connection. Kati/Low Back for Low Back tension. This specialized therapy relieves and nourishes the lower back using herbal oils or ghee. The hot medicated oils helps melt lower spine rigidity and strengthen your bone tissue. The oil helps to both nourish and strengthens the muscles and nerves and may even help with flexibility. This is both for chronic pain and acute spasms. As a health coach, my goal is to guide you towards wellness by empowering you to make lasting lifestyle changes and reach your health goals. Let’s facilitate behavior change in a structured support partnership. We focus on the mind body and spirit. Often, I will recommend 2 sessions monthly depending on your goals. Food Food all the time. We do a quick food assessment, review and solve challenges in the kitchen, discuss pantry clean up, and establish strategies for meal planning and recipe brainstorming. Condition specific packages coming soon!